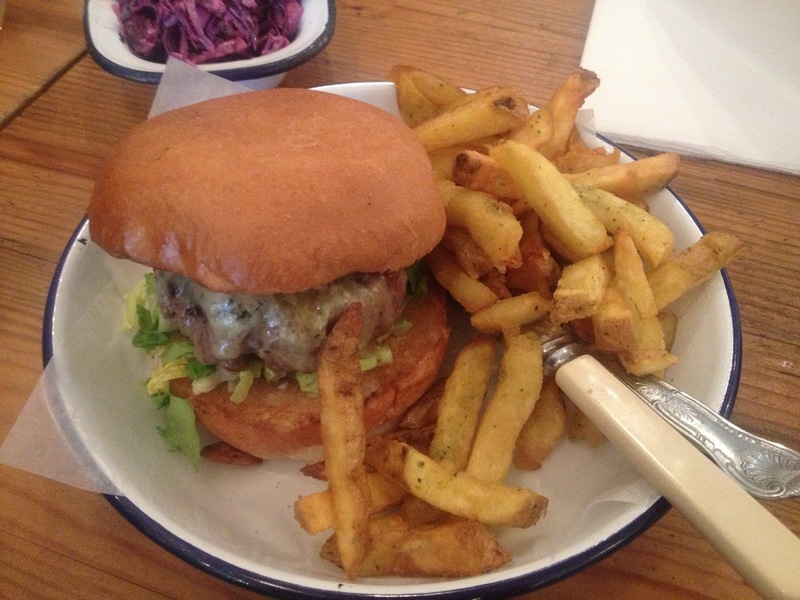 Burger and chips was something that I never really fully appreciated until my visit to Byron a few months ago. I’d always thought it was a bit of a boring option and thought how could a burger and chips really vary that much from place to place….. it turns out, quite a lot! Honest Burgers has been around in Soho for a little while now, but tucked away down Meard Street I kept forgetting to pay a visit. I eventually went along one weekend with my colleagues for a slap up lunch to appease the fact we were at work on a Sunday. This is a simple restaurant with a simple menu and simply good, honest food. I ordered a cheese burger with stilton which comes with a red onion relish and lettuce and the beef patty is cooked medium rare, which I love, but if you prefer your meat well done you can request otherwise. 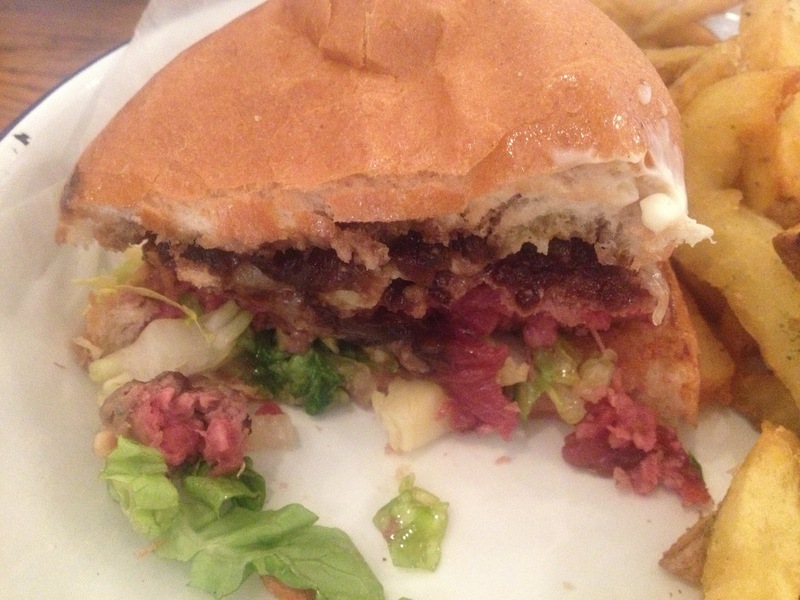 The meat in this burger was nothing short of delicious: perfectly cooked and so so juicy. I couldn’t fault it, it was delicious. Both the red onion relish and the stilton added some great flavours but didn’t overpower the meat and the bun soaked up all the juiciness but held the whole thing together nicely. All the burgers come with an enormous pile of the house rosemary chips which are really unique to Honest Burgers. You’d be surprised how difficult it is to find really great chips, a lot of places treat them as an after thought and they end up being distinctly average. It’s also not easy to find original chips and if there is a bit of variation on a menu it generally only stretches as far as sweet potato fries. I’ve not had chips like these before, the first bite really sparked my interest: crispy, fluffy, tasty and different from the norm. The only fault I had with these chips is that they were just too salty. When the waitress brought our food over and I started perusing the condiments (great selection) I thought it seemed odd there was no salt on the table and I thought I’d ask for some once I’d tucked in and tried some, however after a few bites I understood why there was really no need. Since I like to dip my chips in mayo that did subdue the saltiness so it wasn’t a massive issue for me. I might have to make Honest Burgers my go-to burger joint I loved it that much. I cant wait to go back, it was absolutely excellent and at £6-8 for the burger and the chips very reasonably priced for such great quality.